Details: Seen in the Morden Station car park on 11th December 2018, this Peugeot Partner van is in a bit of a grey-area in terms of whether it is a 'proper' LTSV or not. It had recently been delivered to replace a London Highways Alliance van, but the only lettering it carries is for TfL. The London Highways Alliance, which I believe is a consortium of contractors, has a fleet of vehicles in the livery seen on the car in the background. As their main function was to do with road maintenance rather than public transport, I had no intention of including these vehicles in the LTSV website. However, the change of LBSL Infrastructure Development to TfL Asset Management seems to be seeing more of a merging of operations. 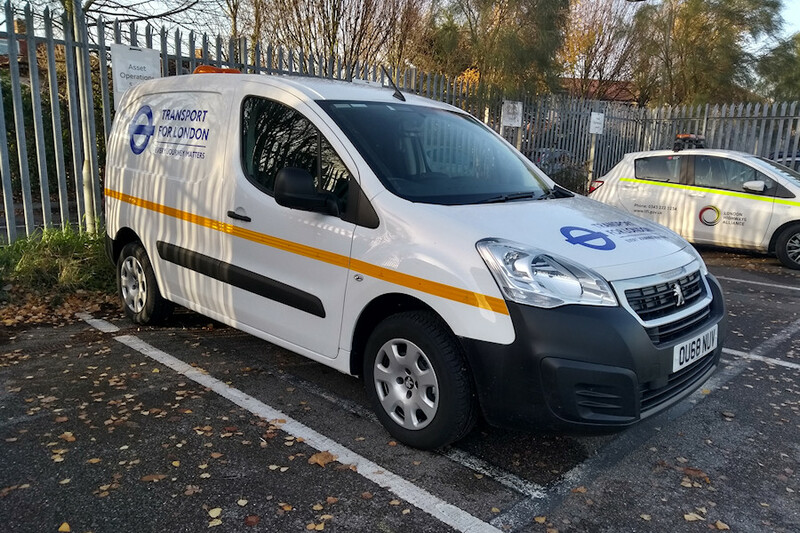 Highways Alliance vehicles have been seen at Morden for the past year or so, while some of the former LBSL red/orange vans are now believed to be based at Highways yards (notably at Harlesden and Picketts Lock). I am open to persuasion but my initial view is not to include this vehicle in the LTSV database. It may appear to be a TfL vehicle but I suspect it is actually operated by a contractor, and that it will have certainly not have been procured by the nice people at Acton Works! Having said that, when a similar situation arose in 2012, I did add the vehicle. Umm. Just to confuse the issue even further, I have just noticed that the car in the background has a small London Buses logo in the passenger window! Both vehicles are parked in bays marked for 'Asset Operations South'.